Gutter Helmet® of Northeast Texas has been installing gutter protection systems since 2001. In our more than 10 years in the home improvement business, we have seen firsthand how Gutter Helmet® has changed the lives of our clients in East Texas. If you have lots of trees (especially pine trees!) in your yard, you know very well how difficult it is to have to clear your gutters regularly or else risk expensive water damage. With our patented gutter protection system, leaves, twigs and even pine needles slide right off and fall harmlessly to the ground while rainwater runoff flows steadily through your clog-free gutters. If you don’t want to waste another weekend mucking out gutters, we will make sure you’ll Never Clean Your Gutters Again®! And if you no longer feel safe climbing a ladder, Gutter Helmet® has your back. At Gutter Helmet® of Northeast Texas, our goal is to provide professional, high-quality customer care from the time you make your first call to our office and even after your installation. 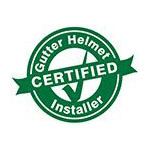 Our installation crew has been trained by the Gutter Helmet® corporate office and is committed to making your home and its welfare their first priority. Our service area covers all of Northeast Texas, including Alba, Hideaway Lake, Holly Lake Ranch, Lindale, Longview, Mineola, Quitman, Scroggins, Winnsboro and Yantis. Our office is located at 1067 Highway 37 South, Building B, Quitman, TX 75783. Give us a call today at (800) 824-3772 or come by our showroom and find out what so many happy homeowners in East Texas are talking about. Our Gutter Helmet® sales representatives are ready to assist you in your inquiries.